We had some snow Today, about 5inches (12cm). I love snow, played with it at daycare today in the sensory table. Just like Opa! In home depot I had to drive this lawn mower. Hi, I love my bagel I always get when we go shopping. And I got a new Elmo book from mom. Elmo says hi. We went finally to a restaurant again and I just loved it. 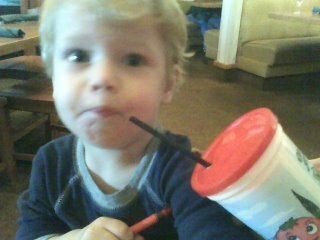 I got a chocolate milk shake, mmmmmhhh so good, I can drink that every day! Yes our little boy is doing the dutch “Klompen Dans” on his clogs he got from aunt Joke. They feel warm on my feet but with this weeks temperatures I don’t need them probably. Look at me on my bicycle, I really feel like the bike dude across our street..